After positive feedback on first EventIDE webinars, we decided to carry them regularly, once per one week or two weeks. The webinars will be given by a EventIDE developer and you need just a web browser to join. We especially encourage new website visitors to attend the nearest webinar, in order to get more detailed information about EventIDE. make a support session answering your questions, etc. If you have a Google+ account already (not Gmail, see below! ), simply add the Okazolab Google+ page to one of your circles, for example, into the ‘Following’ circle. 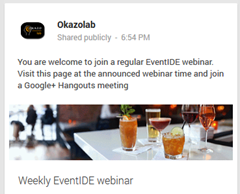 Once you are able to log in on Google+, go to the Okazolab Google+ page at the announced webinar time and join an on-air Google Hangout meeting by pressing the button ‘Join Hangout’ in the top post.
. You can always check which ‘shared’ accounts have been reserved for the coming webinar on the Okazolab Google+ page. It’s might be good idea to confirm your attendance beforehand by pressing the “Are you going? Yes” button on our Google+ page. The total number of participants is limited in Google+ Hangout by 10 persons. If a webinar will fully booked, please register for the next. The duration of a webinar will be set at need, normally ~ 1 hour. Note that you can join the webinar at any moment after it begins and leave at any time. We will be grateful, if you share the information about webinar to your colleges. Everyone is very welcome to join!